Nice art, super random.. kinda fun.. 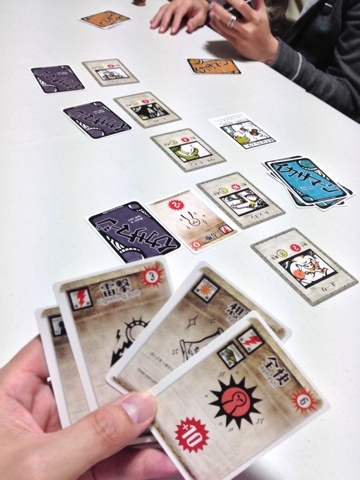 I have been wanting to try Seiji's other games and I was lucky that Bill brought over Cheaty Mages and we managed to get in a game of it after dinner. Cheaty Mages is a light filler that reminds me of Colossal Arena, another game from FFG. Players first lay a bet (on 1 to 3 creatures) available. Then in turn order (whoever has the most coins go first) they will play a card from their hand or pass. If you pass, you are out for the round. Cards you can play will typically manipulate Mana to the creature and/or manipulate the strength of the creature. After all players have passed, all cards are revealed and checked against the conditions set by the Judge (a judge card is revealed at the start of every round). Any remaining creatures (that passed the conditions set) will compare their strengths and which creature that has the most strength will win the round. Players will then get payout depending on their bets. Its an alright game as its fast and quick. Very random though so this is a filler for sure. Some players will probably not like it because of the randomness but there is some bluffing involved and definitely a lot of interaction because players won't want you to mess with the creatures they have bets on yet you don't want to be too obvious helping your creature as well! I love the art. Seiji's games have art that appeals to me. Its mostly heavy lines and some colors and looks rugged to me somewhat but it comes together quite well. All in all, I had fun but I doubt I will keep a copy for myself because its rather light. Its a good filler or an end to a long game day but not as the main dish. Try before you buy!